@61 to believe that the rise of Salvini (and Orban, and Kaczynski, and Trump) is a case of "power to the people" is naive to say the least. The problem is not the poeple, but the 30+ years of neoliberal policies that have devastated the middle class. The fact all the above mentioned wannabe tyrants share the same exact tactics (fearmongering, external enemies, "let's go back to the good times") is a clear sign of this. Afterwards we could perhaps talk about correlation and causality, but I&apos;d like to see your data first. Your link leads to a blank page in #Klar. Anyway, I&apos;ve looked it up. Being a technical type, I work with data not mere assertions. If you have provided that information on this thread, I haven&apos;t seen it. But, on the other hand, the evidence of the devastation brought onto western middle class by neoliberal policies is so abundant and widely accepted as conclusive that pretending this is just me "saying so" is borderline trolling. That's all. I do not deal with these specific aspects, but I do do market research with some regularity. I don&apos;t recall seeing any indications of the Western middle class having become objectively poorer or smaller since the end of the Cold War. The only thing I have seen is increased fiscal pressure (which a priori would be in line with an enrichment of said middle class). @61 the problem is not the middle class emerging in BIRCS countries (and mind you, we refer to it as "middle class" only because it's comprised of people who are marginally better off compared to the BRICS poor) but the way the wealthiest people on the planet (the famed 1%) vacuumed up wealth. See the B point in the attached chart? That's the western middle class. How did they get there? The two billionaires I&apos;ve personally dealt with, through hard work, stamina and sheer single-mindedness. Systemically, any of us had the same chances. Just saw your graph. 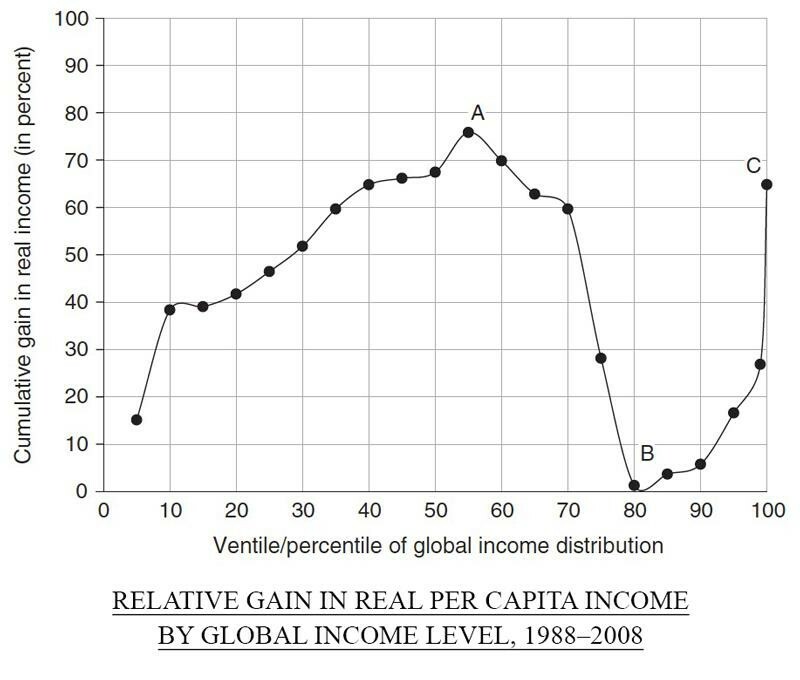 Are you saying that the #Western middle class is on the 80th percentile of global income distribution? That&apos;s hardly something to whine about is it? Also according to your graph, the highest gains were obtained by those in the 0th‒70th percentile, so the lower middle class and the poor. And nobody has actually lost anything (no negative ordinates).